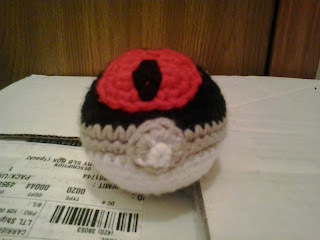 This is part of a continued series of PokeBalls. This is a Annie’s Bal. Great Ball is one of many PokeBalls available in the Pokemon video games. This Great Ball can be made two different ways. It can be made by simply stuffing the Annie’s Ball with Polyester Fiberfill or by inserting a tennis ball where indicated. I made the one featured in the photo with a tennis ball inside. Worsted weight yarn: Black, gray, white, and red. Rd 8: sc in each sc around. (42) Change to gray. Rd 10: sc in each sc around. (42) Change to white. Finish off leaving a long tail. Weave tail through sc of Rd 17, pull tightly, and secure. Weave in ends. Finish off leaving a long tail. Sew BUTTON to ANNIE’S BALL over Rds 9 and 10. Rd 3: sc in next sc, 3 hdc in next sc, slip st in next sc, 3 hdc in next sc, sc in next sc, slip st in next sc. Finish off leaving a long tail. Sew LIPS to ANNIE’S BALL. Using black, embroider spot on LIPS. Annie’s Ball, PokeBall, Pokemon is copyright Nintendo and their respective creators.